I have written this post a hundred times in my mind over the course of the last year and two months. You’d think I would be so excited to share the news that it would have written itself, but apparently you’d be wrong. It has taken me a while to accept the fact that success doesn’t have to look like I wanted it to look. In December 2017, I made the decision I had been avoiding for years and made an appointment to see an ophthalmologist about eye surgery. Prior to this decision, I had exhausted every possible vision therapy option, including waiting for Dr. Davies to be trained in Syntonics. I was the first patient to use the protocol, even though they encouraged him to not choose the most difficult patient first. I didn’t notice any improvement, so that didn’t last long. The determining factor in making this choice was that I was reading again in Susan Barry’s book Fixing my Gaze and came across the spot where she talked about how it’s possible to gain stereopsis when the eyes are properly aligned. (I haven’t been able to find the exact quote, an issue which I have used as an excuse to not write this blog post.) She had eye surgery as a child and had enjoyed good cosmetic results, (i.e. her eyes were aligned prior to vision therapy.) Reading that statement hit me with such force! I said to myself “that’s what I’m missing! I can’t make my eyes align, so my brain can’t do what I’ve been trying to teach it!” I had been hoping that when my brain knew, my eyes would cooperate, but that wasn’t happening. It’s probably a mystery to most people why I was so resistant to surgery. Basically, I just don’t go to any doctors, so the only doctor I had seen in years was my vision therapy optometrist, Dr. Davies. I gave birth to my last four babies at home with a midwife and any time someone gets sick I pull out the homeopathic remedies. Even though my brother had eye muscle surgery as an infant and young child, with good results, I didn’t want to go under the knife. We tend to hear all the horror stories about surgery instead of all the successes! In July 2016, I started receiving insurance benefits at work after years of having no insurance, but my deductible was $4500. So between my ideological and financial constraints, I was decidedly against surgery. With my insurance came a health savings account, where I was able to accumulate some funds towards the deductible and my mom offered to help because she knew how much it meant to me to resolve my eye issues. My excuses were evaporating and I finally realized that my dream of achieving stereopsis with vision therapy alone was at an end. Dr. David Petersen was recommended to me by my vision therapy optometrist, Dr. Jarrod Davies. At my preliminary visit in January, I met Dr. Petersen and his staff and felt very comfortable with them. He went over what he would recommend and completed initial testing. They were getting a new machine in their office that measured stereopsis ability and wanted to test me before scheduling the surgery to make sure I wouldn’t end up with double vision. I readily agreed to wait for the machine to arrive. It took a little longer than expected, but I when I completed the testing, I did exceptionally well. I’m sure it was due to all the vision therapy I’ve done over the past few years. My eyes wanted to work together, they just needed alignment. Surgery was scheduled and I was told I would need to wear glasses for a few weeks with a prism attached to the left lens. The prism was designed to mimic the change that would occur in my vision with the surgery. I haven’t worn glasses full time since I was 15 years old, so that brought back all kinds of unpleasant feelings from my childhood, and the prism made my eyes look pretty funny. It seemed to bother me the most though, and before I knew it the day for surgery arrived. My eyes looked their very worst right before the surgery because of the effects of the prism. The staff at the hospital were amazing and encouraging, telling me how great my doctor was. My mom drove me there and waited during the procedure. It went extremely well and I was soon on my way home to recuperate. After two doses of pain killers I decided to go with my homeopathic remedy, Arnica. I finished the antibiotic recommended, but otherwise just took Arnica. I had the surgery on Thursday, March 23, 2017 and was back to work by Monday, March 27. I took it easy physically for a couple of days, but basically continued my normal routine. My eyes were pretty red initially, but when I went back for my one week checkup, Dr. Petersen was amazed at how quickly I was recovering. I attribute my quick recovery to my choices regarding medication and my healthy lifestyle, but also feel very blessed that the process was so easy. Emotionally, though, I was still grieving the fact that I had to resort to surgery. My eyes feel different than they did before the surgery. It’s difficult to explain, but it feels like it did when I wore the prism. I can feel that they work differently. Sometimes I forget about it and everything seems normal. Then I wonder whether I am fusing correctly and the feeling returns. A few days after the surgery I returned to vision therapy and had a weekly session for several more months. I had a little bit of double vision initially, but nothing like what I had experienced prior to the surgery. At the conclusion of my therapy, Dr. Davies said my vision is comparable to Sue Barry’s. I am grateful! It’s taken me a long time, but I have accepted the fact that for some of us, surgery is a necessary component to achieving more normal vision. I’m glad it wasn’t necessary for my daughter or my son, and that they were able to have vision therapy in their youth. But for me, eye muscle surgery was the key to success. My intention in sharing my story is to reassure others that the solutions are there, we just have to find our way to the appropriate option for our individual needs. Feel free to comment below. I plan to post additional updates regularly from now on. I promised an update and unfortunately that did not occur in a timely manner. I apologize for that. I had an evaluation by my vision therapy doctor and learned that I had not made any observable progress towards my goal of stereopsis. I became discouraged and stopped working on any vision therapy. I have told myself that I should start again, but have not followed through on that intention. The E.Y.E. unit, or Eyeport Vision Training system apparently did not help in my case. I went through the recommended 12 weeks of exercises plus a few additional weeks before my doctor evaluated my progress. My doctor has recently encouraged me to try it again, so that will be part of my new regimen. I will also be looking for things I can do between phone calls in the off season at work. I have been working for the past 21 months as an insurance agent, selling medicare supplements over the phone. That means I am looking at a computer screen for 6+ hours per day. I feel like my vision has gotten worse and my eye turn is more pronounced, so it’s time to take action. Even though my doctor didn’t observe improvement, I felt like my eyes were improving while I was in vision therapy, and it was easier to do the limited things I could do (like fusion up to 12”). Additionally, my daughter was evaluated at her yearly checkup and she had lost some ground. We had a few therapy sessions to get her back up to speed. I guess my family is among those who need to keep doing vision therapy exercises at home in order to retain their results. Our doctor recommended she do therapy at home once a week. She continues to have great results from vision therapy. I have not been so lucky yet. Wish me luck! More Evidence that Vision Therapy Works! Last week I expressed my gratitude for my vision therapy journey because doing it for myself has meant that I discovered my daughter needed it and she had great results! Three weeks after that discovery, I took my 16-year-old son in for a routine exam. Because Dr. Davies does comprehensive exams, he discovered Andrew had convergence insufficiency. It was as bad as he had ever seen. Wow! Finally an explanation for why my son didn’t do his school work. Andrew could do the work, but most of the time he chose not to. This had been the pattern for years. If he really liked his teacher, or the subject, he would do it, but usually not. He didn’t qualify for any special help because he was able to do the work. We had him tested in sixth grade for learning issues and he was ok. They said he could improve in a couple of categories, one being visual memory, but that alone didn’t seem to warrant their expensive program. We did counseling through the school district, he participated in the study skills class, had extra time to do his work during a lunch/study program and still he was failing classes. If he completed an assignment, he got an A. He just didn’t do very many assignments. After years of this pattern, and him thinking of himself as lazy, things didn’t shift immediately. Andrew completed vision therapy in 23 sessions and I anticipated he would begin to do all of his schoolwork, but he didn’t. Things improved, but he was still failing his classes. A couple of months after finishing VT, we made a real paradigm shift and switched high schools. The new charter school was smaller, had less busy work and more in-depth discussions. He started participating more in class, smiling, making friends and was generally happier. It took longer to transition into doing all the coursework, but now he is on track to graduate from high school. 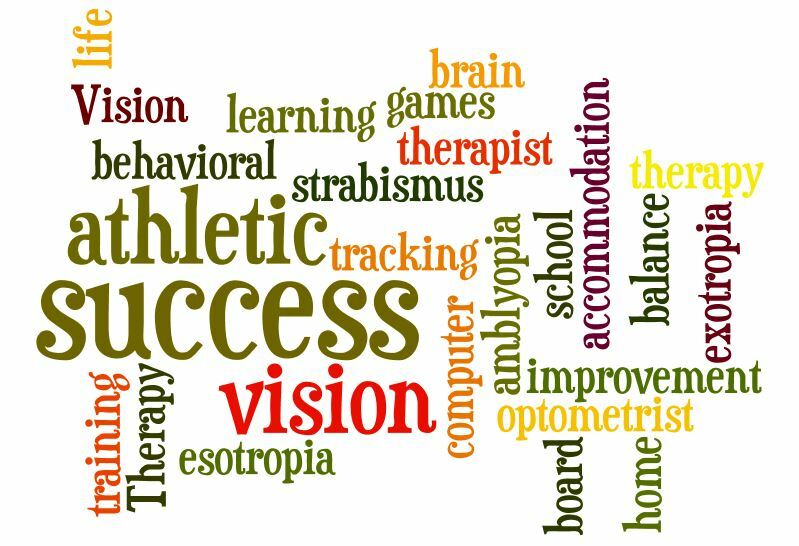 Vision therapy has given him the focus to better reach his goals. His next regular checkup showed he had regressed a little, but he can do home therapy to hone his skills. I wish we had discovered vision therapy when he was six instead of sixteen. My feeling is that his motivation and confidence could have been dramatically improved had that been the case. But we are getting there and I am extremely grateful! Does Vision Therapy Work? Yes! and I have proof! Recent visitors to my blog may have wondered whether vision therapy actually works. I am only one of the VT bloggers who are telling their story, and as adults, we all seem to be in the slow lane of this process. Like most things, vision therapy is not an exact science. Therapy that works beautifully with one person may not work with another. And adults are even trickier, because we’ve had many more years of ingrained compensatory practice. However, I have proof it does work in the form of my two children. Today’s post is about my eleven-year-old daughter, who did vision therapy at age 9 ½, graduating after 37 sessions. I am grateful I was doing vision therapy myself, because otherwise I may have never known it was what she needed. Abby had glasses but didn’t always choose to wear them, which made me wonder about how helpful they were. She has always been a good student, learning to ready early without seeming to struggle. There were times she didn’t finish her work, but she responded to encouragement and didn’t complain much. So, I really didn’t notice much in the way of red flags. I wondered if there were issues mainly because she had manifested an eye turn at age 3, just like me. That’s when I first took her to the eye doctor and he prescribed glasses for her far-sightedness. Like me, her eye turn went away with glasses. A few months later, I began my own in-office vision therapy and started doing massive research into the issue to deepen my understanding. This included reading everything online I could find and any book I could get my hands on. So, my doc loaned me When your Child Struggles (see previous blog post about this book). I was initially interested because of what I was noticing with children in the classroom where I was the substitute teacher. I asked my daughter the questions on the checklist as a practice more than anything. When she responded “Yes” to the question about the whether the words split apart when she was reading, I was stunned. My daughter was seeing double! I continued: “Do you ever turn your head to read.” “Yes.” “Do you ever cover one eye when reading?” “Yes.” Then she told me that she also reads in bed with one eye in the pillow, to avoid seeing double. Basically, she was a master accommodator! So, her strabismus didn’t seem to affect her; she appeared to be doing fine visually. She would go without her glasses and sit really close to the tv, but we didn’t understand why. She would also blow up unexpectedly at times, reflecting a level of frustration that we could not understand. When my husband took Abby to see Dr. Davies, he found she had esotropia, like her mom. She sailed through vision therapy, with wonderful results. And it turns out that the under-correction I had requested was actually helpful in the process! As I have mentioned in previous posts: in my experience only behavioral optometrists will correctly diagnose and treat strabismus. Abby enjoys great normal vision now! She loved her first 3D movie experience, Life of Pi. (See my blog post on other reasons to see a 3D movie). Abby seems happier, less prone to dramatic outbursts, and easily completes her work. Piano seems easier now too. Results would seem more impressive if she had been visibly struggling before, but it was all below the surface. Best of all, she won’t be subject to the life-long struggles of her mom, including my present eye turn and her therapy took just months, not years. I haven’t seen strabismus mentioned specifically in a movie until I watched View from the Top with Gwyneth Paltrow, Candice Bergen, Kelly Preston, Rob Lowe, Christina Applegate, Mark Ruffalo and comic Mike Myers. I frequently pick up movies at garage sales for $1 and was attracted to this 2003 movie because it’s “In the hilarious style of Legally Blonde and Sweet Home Alabama,” movies which I enjoyed. I am not a big Mike Myers fan, but I like the other actors. I was caught off guard when Myers first appeared on screen, because of the marked strabismus he exhibited. I’m sure his fans have seen his cross-eyed antics, but it was new to me. Other images of Myers on the internet don’t show this pronounced eye turn, so I speculated for a while on how he has the eye control to be that cross-eyed at will. A closer look at other photos indicate that he is right-eye dominant (like me) and his eyes look pretty straight when he uses his dominant eye. But, in this movie he chooses to use his left, non-dominant eye, and the turn is quite pronounced. I’m speculating because it’s something I have noticed in myself, but these photos illustrate what I’m talking about: focusing with the right eye vs. the left. The clip actually cuts out Kelly Preston’s character’s last remark, which is also so accurate to what I have experienced. She mentions his eye and then says “Oh, I didn’t notice.” Yea, right.! It’s over the top in making fun of the airline industry as well as strabismus. Rated PG-13 for language and sexual references, I may let my younger children see it and fast forward through the objectionable parts. They were watching when I was looking for the clip though and thought it was “stupid.” In this type of comedy, that’s pretty much the point. Legally Blonde is equally extreme in it’s characterizations. My initial excitement in experimenting with natural yeast has worn off. Most of it was squelched by my family and I have realized that I should have probably gone about the whole process in a totally different way. I wanted to try everything at once and they were not so anxious. Therefore, they were the guinea pigs when the recipe didn’t turn out quite right or when I tried the one that had a stronger flavor than they were prepared for. My husband actually complained that his sweat smelled sour because of all the sourdough in his system. I didn’t notice it, but he seemed to think it was a real problem! The bottom line here is that I may have gone a little overboard in applying this new practice in my cooking. How many other things in life can this little idea apply to? My children have continued to beg for me to just let the yeast die! I dehydrated some as a precaution in case that actually occurred, and then I practiced controlled disregard. I kept the natural yeast start in the door of the refrigerator like usual, but I didn’t look at it very often. Then, when it looked really hungry, I would feed it and then use a little in some waffles or English muffins (the items that got the least complaints), or just feed a cups worth and throw the rest away. This has continued for a while now. 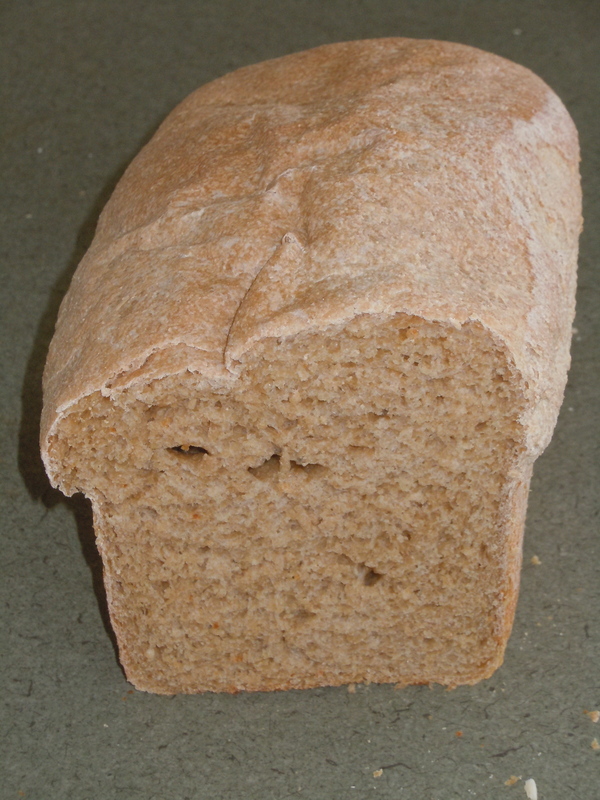 The bread in the freezer actually got used without too much complaint and yesterday I decided to make bread again. Summer vacation is almost here and we’ll want sandwiches for lunch. This time I used the recipe that Melissa Richardson (author of The Art of Baking with Natural Yeast) indicated was the most acceptable to those who are not excited about sourdough. I’m pretty sure that my family knows it’s sourdough because I forgot about it last night when I was supposed to do the second raise and bake it, so it got an extra long rise time (like 18 hours instead of 12). This morning when I remembered, it had much more than doubled in volume! I made sure to use my timer that has to be manually turned off to time the 2 ½ hour rise so I wouldn’t forget. 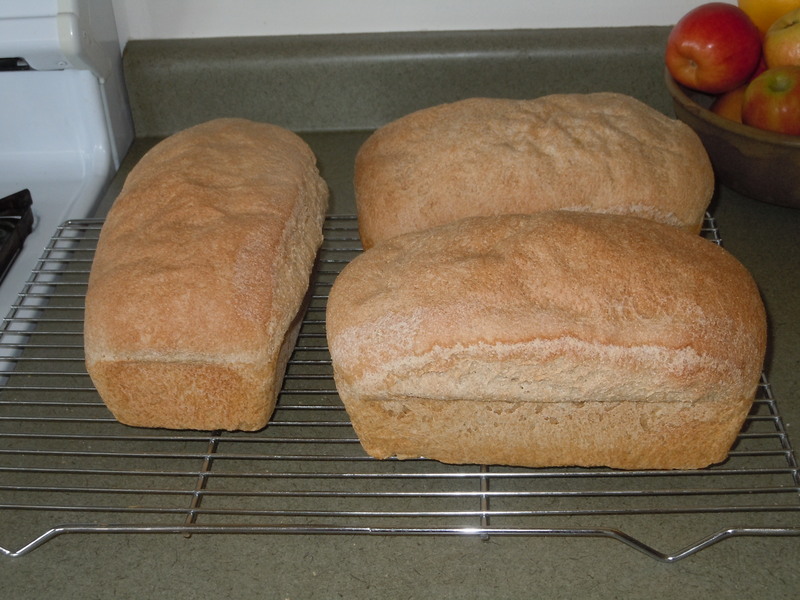 The bread is not as pretty because of the extra time raising, but it is nice and light. I love it! I hope my family will find it more palatable. There is still a mild sourdough flavor, but I plan to have enough molasses on hand for next time. I didn’t have quite the recommended amount yesterday and was loath to go to the store just then. The molasses is supposed to really mask the sourdough flavor. If they want different bread, they know how to make it, and I will at least have bread for me:) I thought about just making sourdough items when they’re not around, but the long rise times make that a bit difficult. They’re bound to notice when there’s dough sitting on the counter, covered with a damp towel. Little by little, I’m determined to convert them, just like I’ll convert my eyes to seeing in stereo! My behavioral optometrist, Dr. Davies, recently shared a fun new book with me, as well as the accompanying website. 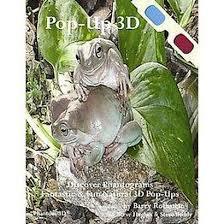 The book is entitled Pop-Up 3D: Discover Phantograms, Fantastic & Fun Natural 3D Pop-Ups, by Barry Rothstein, Steve Hughes & Steve Boddy. The website is http://www.3ddigitalphoto.com/default.asp. The fun part for me is that I can actually see the 3D images and I don’t have to be as close to the image as when I look at the Magic Eye books. My hope is that I can gradually work to expand my range and depth by looking at these images. I have a sense that the images could pop more than they are presently for me, and that’s what I’ll be working on as well. My ten-year-old daughter Abby, who I have mentioned in previous posts, really enjoyed looking at this book. Abby is like the miniature version of me as far as strabismus is concerned, but has now developed wonderful 3D vision. I asked her how high the images were popping and I feel that she sees them more true-to life than I do. For me the image is at a slight slant rather than standing straight up on the page. Both resources explain that phantograms are images that are drawn or photographed to imitate normal vision. 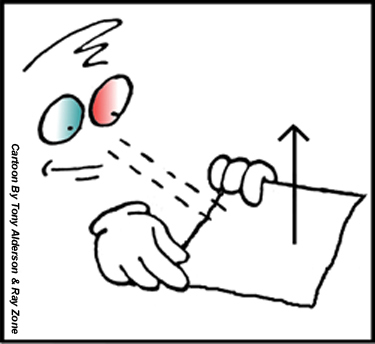 When viewed with red/blue glasses (with blue on the right eye) the images leap off the page. The image is intended to be flat on a table or desk, or on your knees and you view it at a 45 degree angle. They have a cool tutorial on the website that tells you how you can photograph your own phantograms. Apparently it’s a bit tricky, so I probably won’t be trying it anytime soon! They also include a cool freebie on the website, an image of the week. They allow you to print one for your own use, since it needs to be viewed while laying flat. I attempted to print out the image for this week and it wanted to print on two pages, (just a bit of it on one page, but I didn’t print it). There’s probably a trick to resizing and getting it on one page, but I didn’t figure it out. However, I did print page three which included images of the week for 5-25-13 through 2-16-13. The images were pretty small, but I could see them popping off the page. I just had to get a little closer than I do when viewing the book. The website is also a great place to buy the books (with imperfect copies at a discount) as well as replacement 3D glasses and 3D note cards. The cards are $3.75 (or less in bulk) and come with the 3D glasses to view the image. If you have some 3D glasses with blue on the right eye, you are all set to print out that image of the week and check it out! Some are color blind. I am stereo blind.